Yes, by any other name* a rose would still smell as sweet. 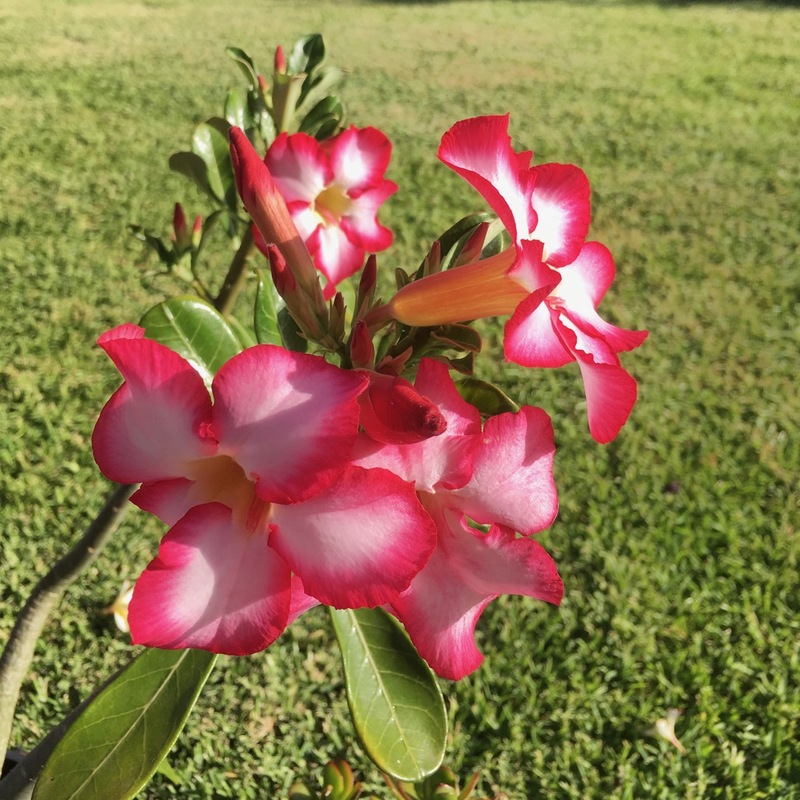 This is my Desert Rose – my only Adenium and, as you can see, it is currently in full bloom. Look what Becky started – Square Primary Photos! This lovely plant belongs to the Apocynaceae family, aka the dogbane family and like all plants in this family, you must be very careful with the sap as it is poisonous and should not come into contact with pets or children. Adenium obesium, as my variety is more commonly known, is also called Sabi star, mock azalea, impala lily and desert rose. I can understand the ‘desert’ part of their common name as they are native to Africa and the Middle East, but they’re certainly not roses. They are actually more closely related to Alamandas, Oleanders and Frangipanis. My sister-in-law, Donna, loves these plants and has an extensive Desert Rose collection. I might only have one, but it is lovely and I think it is rather cute, all two feet of it. This is yet another gallery of photos taken with my iPhone. Adenium makes for a wonderful ornamental plant and is often grown as bonsai. They can be pruned, and new plants grown from cuttings – just like Frangipani. But with only four flowers opened, and another 24 buds in various stages of blooming, I will have to wait to prune it. But I will try to strike some new plants when I do. * William Shakespeare’s original text read: “That which we call a rose by any other word would smell as sweet.” and the reference is often used to imply that the names of things do not affect what they really are. Lovely rose Clare; there’s some great colour about at the moment isn’t there? What a beautiful flower. Thanks for the information on them; I had never heard of them.